Mystical Parties...our name says it all, especially when it comes to children's parties. We provide elite entertainers for Atlanta princess parties. 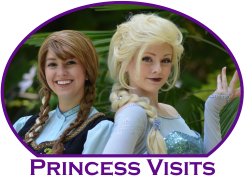 Whether you are looking for a Princess at Royal Ball, a Superhero fighting crime, Pirates seeking their treasure or a cool tween party entertainer, we can help. We know how special birthdays and other events can be to you, and that is why we are proud to be one of the best character party entertainers in Metro Atlanta. Not only are we available for kids birthday parties and special occiasions, we can provide face painters and balloon twisters for trade shows, special events and corporate parties. Experience a magical moment with one of our elite character parties and make it an event your children will remember for a lifetime. Mystical Parties is a member of the International Association of Children's Entertainment Vendors (IACEV).